Please allow approximately an hour and a half for your first visit. When you walk into our clinic, you will be greeted by our chiropractic assistant, Ellen. Upon completion of your new patient forms, one of the chiropractors will consult with you, review our fee schedule, perform a detailed examination, and take x-rays of the area(s) of complaint. If you have x-rays or MRI reports from a previous doctor, bring those--any previous diagnostics will help us get a clear clinical picture of your condition. Typically, treatment is rendered on the first visit, this is part of the reason for the long duration of that first visit! We have a therapy bay equipped with muscle stimulation, hot & cold packs, therapeutic ultrasound, and spinal roller tables (Spinalators). We offer both manual (hands-on) adjusting as well as instrument-assisted (Activator) adjusting techniques at our office. We check your entire spine, from top to bottom, and adjust your spine/render treatment accordingly. We explain everything, step by step, as we go, so that you are informed the entire time you're in our office. After your first adjustment, Ellen will assist you in checking out, and she will set up a time for your follow up visit. Please allow 45 minutes for your second visit. Your second visit consists of your report of findings. 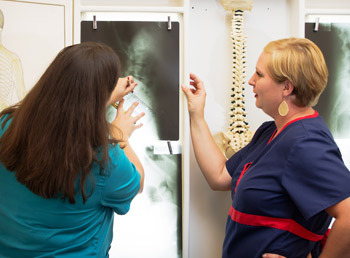 We will review your x-rays with you, tell you what we think clinically, make recommendations for treatment, and review care instructions for your specific condition(s). Any and all questions are welcome! We want you to understand where we're starting from, and what the plan is to get you moving better and feeling better. After the report of findings, you will be escorted to the therapy bay, and then you will get adjusted. Please allow 15-30 minutes for these visits. Visit length is within the 15 to 30 minute range because of what treatment(s) is/are rendered. Please note that our office does get busier during peak times. Appointments are highly encouraged, and we always aim to stay on schedule. Your time is valuable, and we do our best to respect that! Call our Northwest Houston chiropractic office to get started with chiropractic care today!